I guess it is time to explain why I have my pseudonym. Well, nobody asked me before why I chose Linguist-in-Waiting until Susanne did so, so I'll blog it here (By the way, check out her blog, she has amazing pictures with radiant colors and brilliant lighting effects.). It is still morning, I just woke up, and technically, I don't have to go to school, I mean, to my building (I live on campus, so technically, I am at school.) until 2:30, when I keep my office hours. But I need to read, so after this entry, I'll grab some breakfast, take a shower, and take off (Of course, I won't just take a shower and take off, or else I'll be charged with public indecency.). What is with me today and those thoughts-en-passant that seems to be plenty for this entry? I already made three parenthetical comments above. Maybe it's because I just woke up, and my brain is having problems with its synaptic connections still. Ok, back to the topic, my pseudonym. Remember I lived in Japan for almost five years? And remember I loved the book Memoirs of a Geisha by Arthur Golden? And remember I am a graduate student in linguistics? I made a play on words based on my history. First of all, the title. I thought that too many bloggers name their blogs as Ravings of a 20-something... or Rantings about... or Ramblings of a... which is fine with me. But then, as a linguistics student, I wonder why always with an R? That consonant just sounded too violent for me. So I opted for the subtle one. A memoir. A kind of autobiography. But one thing different from traditional memoirs is that I am not yet dead. Then the novel comes to mind. Just alter the last word, and voila! You have my current title. That links the concept to Japanese culture. Which goes to my pseudonym. When I was in high school, since I went where all the Japanese kids were going (I did not go to an international school, which actually helped me become fluent in Japanese [Oh my goodness I am doing that thought-en-passant thing again, and this is worse, a thought-en-passant within a thought-en-passant.]. ), I learned the classics of Japanese, such as The Tale of Genji, The Pillow Book, among others. In many of these ancient works, the character of a lady-in-waiting would always appear. I ridiculously thought, What are they waiting for? Of course, I know the answer now, they are servants for the imperial court. Again, another play on words here. I chose Linguist-in-Waiting because it reflected my secular goal. I am in graduate school and is on the path to be a linguist. Sounds boring to other people, but for me, it is a passion to study something that only humans have. Something that makes us above animals. And according to academic tradition, I still have 5 to 7 years of waiting ahead. Maybe when I get my PhD degree I'll change the title. In the meantime I'll leave it as is. My background also has something to do with the topic. But I guess it is obvious I won't explain it in detail. But back in Japan, I had calligraphy lessons, where I sucked big time. But then, this background is fitting, given my background, eh? I hope this made it clear for my fellow bloggers and my readers. Thank you for your continued patronage. Till next time. Wow that is pretty cool. Way to be different. I love it! Thanks for that little insight. I have always wondered where it came from but everytime it came to posting I was thinking of what to write and forgot. Sorry... But thanks... hope your reading goes well. Talk to you soon. ...and thanks for the link to my site and your appreciating words about my photos!! That's really very nice of you. 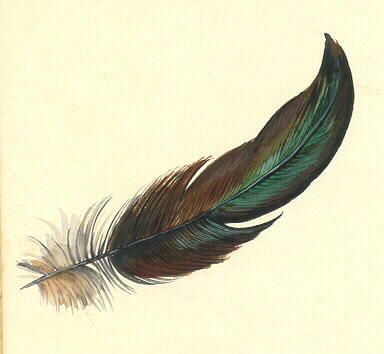 By the way the picture of the feather is beautiful! From which bird is it? And "nom de plume" is a nice title, monsieur! I think you may have the greatest blog header I have ever seen. I am a neophyte travel article writer who also have a graduate background. Candidly, your posts inspired me much and make me me dream to become a linguist like what you are aspiring for. Thank you for reading the blog. And I am glad that I inspire you. Hopefully, we get to reach each of our goals!